I stumbled across this article while browsing the Hwang Jin Yi thread at soompi. Do take a look as there are some very insightful comments that I agree with. Also, if you haven’t checked out Hwang Jin Yi, I highly recommend it. I love this drama. It’s one of the best dramas of 2006/2007. Special thanks to rubie for posting the article. There are times when I feel glad to learn that I was wrong. I used to guess that my 30s would be an end to my fun because of my favorite poem, “Hitting Your 30s and the Party Is Over.” However, I’m glad that I was wrong, because, voila, I’m officially a 30-something now and the party has just begun. Also, I used to jeer at made-in-Korea TV dramas for their love of such cliches as a lead character suffering amnesia or some kind of an incurable disease. However, I found myself proved wrong again last year, especially with a bundle of well-made TV dramas by A-1 scriptwriters like Noh Hee-gyeong of Good-bye Solo and A Miracle and Kim Do-u of What Are You Doing, Fox? 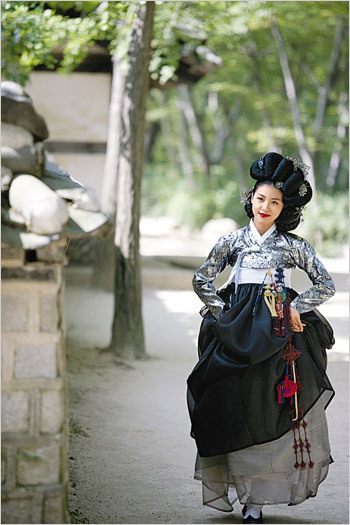 Speaking of Noh Hee-gyeong, whom I have called “Mr.” in my past few columns, I have to correct myself as she is Ms. Noh. And I, who love being a woman, am immensely glad to say that we have another talented woman on the TV scene. After wrongly changing the gender of Ms. Noh, I had a call to correct me from a reader. Allow me to express my gratitude for her kindness to take the trouble to find my cell phone number and give me the right information. I have no excuse but to say I’m sorry about my mistake. I was recently glad again to see my prejudices proved wrong by the TV history drama Hwang Jin-yi, which ended last week on KBS-TV. It told the story of Hwang Jin-yi, who was a legendary gisaeng of the Joseon dynasty (1392-1910). The gisaeng were a class of women who were allowed to learn arts including literature, dance, music and conversation, in order to entertain noble men during drinking parties. In the strictly Confucian society of the time, becoming a gisaeng was the only way for a woman to be allowed to study and display such talents. The first few episodes appeared to be nothing more than picture-perfect “Welcome to Korea” style publicity material to promote tourism to Korea, as the drama showed picturesque scenes of the country with a group of beautiful women dressed in spectacular traditional clothes. 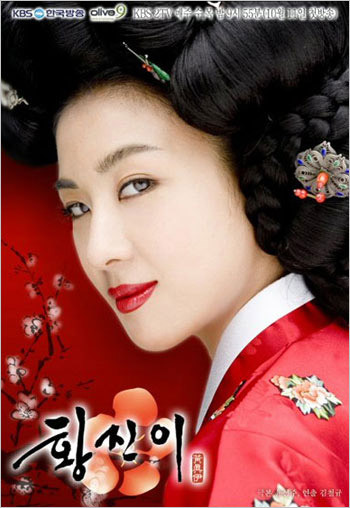 However, as the story developed, the drama earned kudos for depicting the life of Hwang Jin-yi from a feminist perspective. Based on bits and pieces of stories about the character, the drama built up the story of Hwang Jin-yi and her rivalry with her mentor and her contemporary gisaeng. In describing the rivalry, this drama did not rely on the cheap sure-fire strategy of a catfight, but instead, brought a spirit of professionalism to the gisaeng characters, as they refused to be called mere courtesans but artists. The rivalry between the characters was dramatic enough to catch viewers’ eyes, as the characters fought to compete in terms of talent, which they cultivated through harsh training. The lead character Hwang’s mentor, Baekmu, had an icy cold attitude to her pupil yet still fostered her talent and professionalism. When Hwang Jin-yi faced a crisis, her rival, Buyong, asked around for help to save her life, with due respect for their rivalry-turned-friendship. Then they fight elegantly to pit their artistic talents against each other. There is a certain beauty to a catfight when the fighters are not mere kittens but fully-grown tigresses with both respect for each other and professionalism. Another point of the drama was that the male characters played only minor roles. One symbolic scene in this sense came in the second-to-last episode, when Hwang Jin-yi told the love of her life, a noble man, to give her up, saying, “It’s better to shine in our own lives, instead of withering away slowly for each other and giving up our dreams and passions.” This was just one of many punch lines in the drama, which is now sorely missed on KBS-TV. However, now that we have a whole new year ahead of us, I’m keeping my fingers crossed to be able to see better-made dramas from now on. And she added, “For a female entertainer, the closest companion is pain.” Asked if there is a line like that in the drama, Ha smiles. “Yes, it’s a line from the fourth episode. Since I’m going through the joys and sorrows felt by the gisaeng throughout the drama, certain lines speak to my heart word for word.” Ha is an actress who has a wide range of room to be analyzed. In an industry full of stars who have finely chiseled noses and wide eyes, Ha looks like the girl next door. Ironically it was that ordinariness that helped her to grow into a top class actor on the big and small screen. Most of the characters she played in some way broke the mold, and it was possible because of an appearance that can become any character as well as her fine dramatic craft. doozy: Ha Ji Won sounds very modest and down-to-earth. “… nor do I have a lot of charisma.” What is she talking about? She does charisma because although she doesn’t have the most gorgeous face, she has that special appeal that makes her interesting to watch onscreen. doozy: The first episode aired with relatively good ratings (around 20%). I have yet to see it but will post my comments on it once I do. The giant, strikingly beautiful face of Ha Ji-won will adorn walls all over Cannes during the international audiovisual content market show MIPCOM 2006 running there from Oct 9-13, the posters advertising the historical TV drama Hwang Jin-I. KBS Media, which is involved in bringing Korean pop culture to foreign audiences, says at the main entrance to the largest venue, the Palais des Festivals, will be a large visual from the early days of shooting the story of the famous Chosun-era gisaeng (female entertainer). But those involved are trying to persuade MIPCOM to switch those images of the actress for a newer one, which they think is even more stunning: it depicts her lying down and looking over her shoulder with a decorative wig on her head and clad in a jeogori (short jacket). Those in charge of the PR for Hwang Jin-I say they plan to unveil a total of five posters, and they have already heard from people who want to buy the series. doozy: Wow, the poster is so colorful and beautiful! The red really stands out. Upon first glance, I couldn’t even tell that it is Ha Ji Won. She looks really different in the poster. The actress Ha Ji-won came close to despair while practicing the wide range of skills needed for her role as “Hwang Jin-I,” a famous Chosun-era gisaeng or female entertainer, in a new KBS mini-series. Her head endured the leaden weight of a big decorative wig or gachae. Ha confessed to the suffering, saying, “The gachae is too heavy. My neck is already stiff, although I’ve only filmed three episodes. It’s too painful to sleep.” Her fingers are blistered and bruised due to hours of practicing the gayageum, a 12-stringed Korean harp, and geomungo, the six-stringed zither at which the Chosun-era entertainers excelled. Ha is even practicing even tightrope-walking. To keep up her strength, she is eating eels, which are believed to be good for stamina. And her pains are rewarded with a sense achievement: after all, she now has several skills she never dreamed of. “I want to break away from the typical image of gisaeng and create a new one to win approval from women,” she says. doozy: Wow… Now, that is suffering for your art! And man, this is an episode-drama so Ha Ji Won is going to be in pain for a while. Be strong, Ha Ji Won sshi! For what it’s worth, you look gorgeous in the traditional costume. Those pictures above are breathtakingly beautiful! I love the colors and the extravagance of the hanboks. I like her poses as well. She looks very regal and sophisticated.